Francisco de Melo Viríssimo's PhD focused on studying wave behaviour in the real-world using dynamical systems techniques. Waves are everywhere in nature and play a key role in a range of natural phenomena, from ocean circulation to weather forecasting. Mathematical models for these waves are helpful in understanding the real world. Francisco's PhD studied different aspects of waves in fluids using dynamical systems techniques. This is an edited version of an article that first appeared in a newsletter from the London Mathematical Society. When compared to mechanical (e.g. 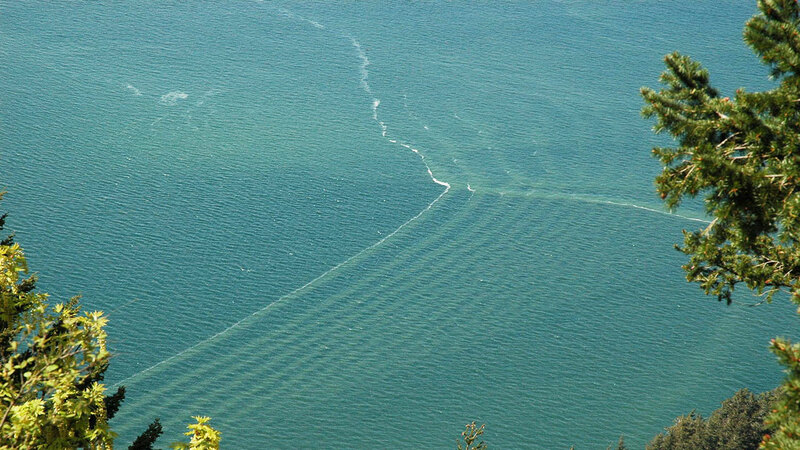 sound waves) or electromagnetic waves (e.g. light), waves in fluids have very different behaviours. For instance, both sound and light waves normally do not interact with each other, waves in fluids do interact with each other, usually in a very complex way. It turns out that most waves in geophysical fluid mechanics are internal, and their existence is linked to stratified flows. These are ubiquitous in nature, with the ocean and the atmosphere as prime examples. Even though modelled by incompressible equations (i.e. with constant density), most geophysical flows are density-stratified, meaning that the density can change due to the concentration of sediments, substances or differences in the temperature in various parts of the flow. Stratification is the main mechanism behind the existence of internal waves in stratified flows. The simplest example is of waves propagating on the interface between two layers of fluid (salty and fresh water for example). A schematic representation of a three-layer channel. Since stratification is intrinsically linked to internal waves, there needs to be at least one interface for a flow to generate and propagate such waves. Most mathematical studies so far have considered the particular case of a two-layer flow, in which there is exactly one interface. Francisco's PhD work focused on the strongly nonlinear, non-dispersive setting of three layers  and thus two interfaces, in a channel bounded by horizontal rigid walls, and also on the study of a model with the same setting but without the upper rigid lid  . 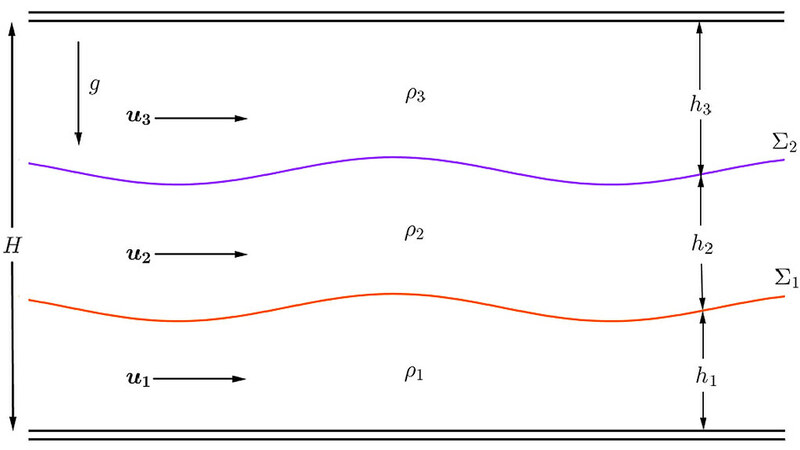 Both of these are important cases as they capture a class of slow (so-called mode 2) internal waves, in addition to a class of fast (mode 1) waves. Mode 2 waves, although less common than mode 1 waves, have now been observed in the ocean and have attracted a lot of interest from the scientific community. 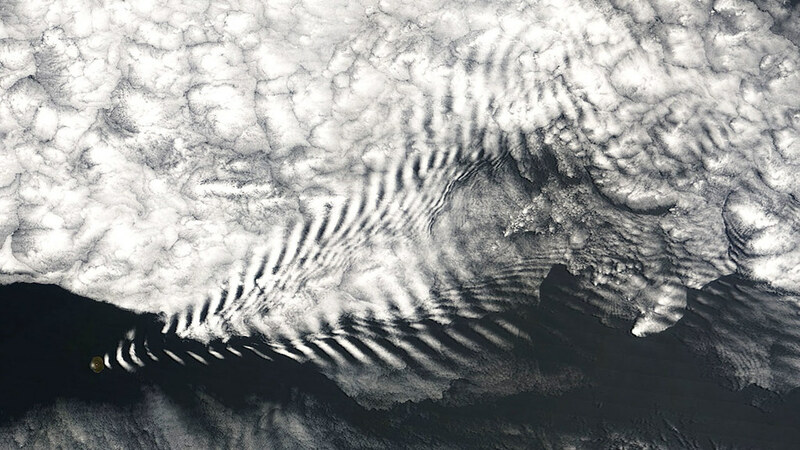 NASA satellite image (MODIS imager on board the Terra satellite) of a wave cloud forming off of Amsterdam Island in the far southern Indian Ocean. Credit: NASA (open source). As expected, the dynamics of waves in a three-layer setting is much richer than in a two-layer flow. In  it was shown that a particular set of pure mode 2 solutions forms an invariant subspace in the phase space. This means that if a solution is initially a pure mode 2, then it will remain a mode 2 until it either breaks or loses stability, which is not the case for pure mode 1 solutions. A question of crucial interest concerns the long term well-posedness or nonlinear stability of the model. In other words, does an initially wave-like (so called hyperbolic) solution remain hyperbolic until it breaks? The answer is yes for a two-layer system, but for three-layer systems it's still an open question. Partial results could be proven for three-layer flows. In particular, on the set of pure mode 2 solutions, the three-layer system is equivalent to the two-layer system, meaning that for each solution of the two-layer problem, there exists a unique three-layer equivalent solution and vice-versa. Therefore, all non-linear stability results in  apply to pure mode 2 solutions. It was also shown that the full hyperbolic region is not invariant under the flow. Layered-stratified flows, although driven primarily by the density differences between the layers, have the capacity to alter the underlying stratification. Most studies assume that the flow remains with the original density stratification over time. 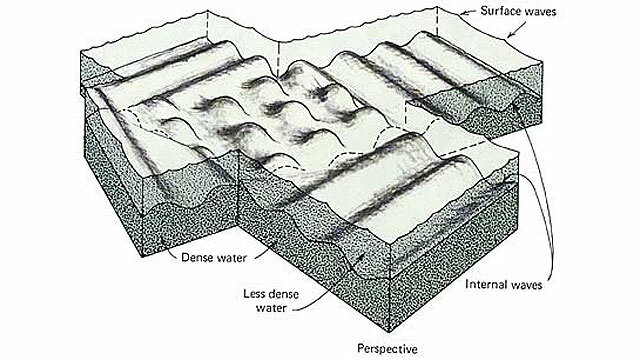 Although this can be the case in many applications, shallow water waves tend to break and can change the stratification. At this point, the movement of particles in the flow can become quite turbulent, leading to mixing and entrainment processes (think of a breaking wave on the beach, for example). These are usually guided by small scale motions that are difficult to model in detail. Part of Francisco's work was to model breaking waves using carefully selected conservation laws which avoid small-scale dynamics  . 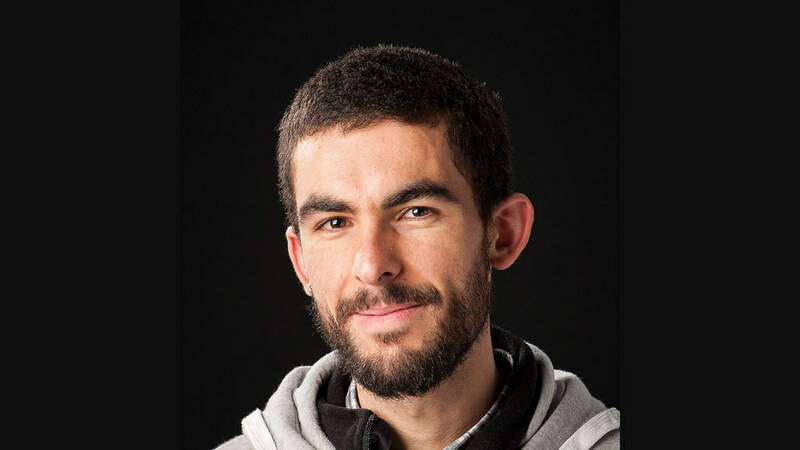 Francisco completed his PhD in Mathematics at the University of Bath, under the supervision of Paul Milewski. He is now a postdoctoral researcher at the National Oceanography Centre in Southampton, UK. His main research interests are in mathematical and numerical aspects of fluid mechanics, but he's recently shifted his interests to environmental sciences. Francisco was born in the Brazilian state of Minas Gerais and has found in pottery a back up plan for the (perhaps not so far-distant...) future. His PhD research was supported by CNPq - Conselho Nacional de Desenvolvimento Científico e Tecnológico (Brazil), under the grant number 249770/2013-0. A. Boonkasame, P. A. Milewski, The stability of large-amplitude shallow interfacial non-Boussinesq flows. Stud. in Appl. Math. 128 (2011) 40–58. F. de Melo Viríssimo, P.A.Milewski, Three-layer flows in the shallow water limit. Stud.in Appl. Math. (Accepted, 2018). F. de Melo Viríssimo, P. A. Milewski, Nonlinear stability of two-layer shallow water flows with a free surface (Preprint, 2019). F. de Melo Viríssimo, P. A. Milewski, Conservation law modelling of entrainment in two-layer shallow water flows (Preprint, 2019). P. A. Milewski, E. G. Tabak, Conservation law modelling of entrainment in layered hydrostatic flows. Journal of Fluid Mechanics, 772 (2015) 272-294.